Substantive policy changes and not speeches alone would determine the success of Narendra Modi’s desire to bolster investment and encourage tourism and manufacturing. Prime Minister Narendra Modi has to move on several fronts simultaneously to fulfil expectations he has generated in various constituencies. Through his foreign trips, especially the high-profile U.S. visit, and his interaction with foreign dignitaries, Mr Modi has declared economic issues to be the focus of his foreign policy. But substantive policy changes, not speeches alone, would determine the success of his stated desire to bolster investment and encourage tourism and manufacturing. Mr Modi’s recent trip to the U.S. was the first time that an Indian Prime Minister pitched India’s case not only at the United Nations or the White House, but also at broader constituencies including the general American public at a concert in New York’s Central Park and the Indian diaspora through a rally in Madison Square Garden. Mr Modi spoke to CEOs of multinational corporations at breakfast, held several one-on-one meetings with corporate heads, and made a pitch for his ‘Make in India’ idea through an op-ed in The Washington Post. After pitching his case to three constituencies — the Indian-American diaspora, the American business community and his voters back home — Mr Modi must now deliver. The laundry list of his promises, both explicit and implicit, is not short and might require bureaucratic as well as legislative action. To the Indian American diaspora he promised lifelong visas and a reduction in red tape. For the American corporate sector he has promised procedural reform and enhanced investment incentives. To the Indian voter he made appeals about reviving India’s past glory; he spoke of taking advantage of the demographic dividend, the need to improve sanitation, to provide clean water and to boost local incomes by attracting more tourist dollars. Pursuing potential partnersMr Modi appealed to the Indian diaspora to not just invest in India but also encourage travel to the mother country. He promised to eliminate unnecessary rules and regulations, make the government more transparent and accountable and thus improve India’s ease of business rankings. His government now plans on repealing 287 outdated laws, most of which date back to the British colonial era, in the upcoming winter session of Parliament. If Mr Modi pulls that off, he would be able to translate the enthusiasm of a high-profile trip into policy momentum. Continuing in the mould of the previous National Democratic Alliance regime, Mr Modi’s government has also promised to improve infrastructure, focus on both cities and villages and on sanitation, health and education. But specific plans have to gradually unfold for specific schemes, and each plan must then be financed. Mr Modi appears intent on securing international partnership for his grand ventures. The concept of using external relations to fund development is not new, but he may have injected fresh vigour into an old idea. During the Prime Minister’s trip to Japan, the Shinzo Abe government renewed Japan’s commitment to help develop India’s infrastructure. Japan has already committed $1.5 billion for Delhi’s mass rapid transit system and will also assist development of the Delhi Mumbai Industrial Corridor. China has committed to investing $20 billion in India in the next few years, most of which will be in the area of manufacturing and infrastructure. Given Mr Modi’s ambition, which now appears to have become India’s aspiration, these are still only a fraction of what the country needs. The government will now have to pursue other potential partners and investors to generate financing for infrastructure projects that are still on the shelf or the drawing board. Growth in manufacturingIndia’s economic growth since the liberalisation of the 1990s has been driven by the services industry. However, India’s large and youthful population needs jobs and expansion in manufacturing. This is essential for the country to maintain high rates of growth. India’s license-quota raj system, excessive bureaucracy, decrepit and often non-existent infrastructure, as well as power and water shortages, have hampered the manufacturing sector so far. In addition, India’s land acquisition laws and labour rules have ensured that manufacturing has been capital-intensive, not labour-intensive, and is often aimed at land acquisition as an asset. All this must change, and change fast, if Mr Modi expects to turn India into a global manufacturing hub — the aim of his ‘Make in India’ programme. The government needs to move forward on reforming labour laws. It must change the Land Acquisition Act passed by the previous government, in addition to finding ways to ensure regular supply of power and water and improving infrastructure. The media, too, has withheld scepticism within reasonable limits. But at the end of the day, the pace at which he implements reforms will determine Mr Modi’s success. Legal and regulatory changes must now come with the same, if not greater, efficiency as the song and dance that accompanied Mr Modi’s triumphant New York spectacle. This piece was first published in The Hindu on October 20th, 2014. Indian truckers, it turns out, spend a quarter of their journey times waiting at checkpoints, state frontiers (there are 650 border posts) and city entrances, and another 15 per cent at toll plazas. In all, they spend only 40 per cent of the time driving, often in herds to comply with urban time restrictions. For the rest, the truck is not moving. They cover just 250km-300km a day on average, compared with 800km in the US. At present the cost of logistics for Indian manufacturers is often more than the entire wage bill – more than double, in the case of textiles – and far higher as a percentage of sales than for international competitors. Halving the delays caused by roadblocks and other stoppages would cut freight times by 20-30 per cent and logistics costs 30-40 per cent, says the World Bank. The Great Recession has accelerated several changes already underway in the world economy for the past few years. Arguably the most significant development has been the emergence of developing countries as engines of global economic growth. It has also exposed several deficiencies in the dominant Washington Consensus model of economic growth. So much so that, faced with its deepest economic downturn since the Great Depression, the US itself is reassessing many of the sacred tenets of the Washington Consensus. The spectacular rise of China and the increasing certainty of India emulating China have meant that Beijing Consensus and now, the "Mumbai Consensus", are slowly gaining wider acceptance. In a recent speech in Mumbai, Lawrence Summers coined the phrase "Mumbai Consensus" to describe the nature of India's economic growth model which has seen the country's chart the troubled sub-prime waters relatively trouble-free. The Indian model is characterized by "a reliance on domestic consumption rather than exports, services rather than manufacturing, and private enterprise rather than state-led companies and investments". It bears striking similarities with America's own growth history and trajectory, and unlike the Chinese model, revolves around private-sector driven growth and democratic pattern of development. Further, India's response to several important global macroeconomic issues has generated the impression that the Mumbai Consensus is closer to an open-market economy driven approach. This feeling gets amplified when seen against diametrically opposite reactions among other developing economies and even developed economies. India's willingness to allow both capital unfettered access into equity and debt markets and the exchange rate to strengthen stands against reluctance among others, both developed and developing, to do the same. These have been part of a remarkable trend where Indian economy charts a path at variance from the rest of the world, one which appears to put India to the right of the economic spectrum. Here are a few examples. 1. The aftermath of the sub-prime meltdown has engendered deep financial market uncertainty. However, despite the Great Recession in the developed economies, the global financial markets have recovered smartly since March 2010. This has been characterized by sharp spurt in capital flows into the emerging economies, whose equity markets are clearly showing signs of froth. It is in this context that, early this year, the IMF broke with its long-held ideological position, and said that capital controls are a "legitimate" tool in some cases for governments facing surges in external investments that threaten to destabilize their economies. There have been an increasing chorus of voices calling for capital controls for developing economies. The World Bank is the latest to advice Asian economies of temporary and targeted controls to contain asset bubbles in the region’s stock, currency and property markets. Before and after the IMF's change in stance, countries like Brazil and Thailand have announced policy measures to limit capital flows. Brazil imposed a 2% tax on foreign portfolio inflows last October. Thailand has imposed a 15% withholding tax last month on interest and capital gains earned by foreign investors on Thai bonds issued by the government, central bank and state enterprises, and is contemplating more controls.Earlier in June, Indonesia introduced "quasi-capital control measure" by making short-term investment less attractive to foreign funds. A few days back, the South Korean government moved to stabilize the won by limiting assets accessible to foreign capital, while Taiwanese officials made some bank deposits off limits to foreign investors. However, despite itself experiencing a steep rise in foreign capital inflows into its equity markets which recently breached its highest ever mark and shows signs of a bubble getting inflated, India has so far refrained from any talk of capital controls. The FIIs have pumped in a massive $26.7 bn into Indian equities till October end. In fact, just a few days back, even as some other economies were contemplating introduction of capital controls, the Indian government again reiterated its resolve to not impose capital controls. Instead it has preferred sector-specific selective credit controls to prevent the build-up of asset bubbles. India's tolerance for higher capital inflows stem partly from the realization that it requires foreign capital to bridge the widening current account deficit (CAD) and to fund its huge infrastructure investment needs. The strong economic growth and its import-intensity, coupled with a not-so-strong export growth and relatively stagnant domestic savings rate, makes foreign capital critical to sustaining high growth rates. In view of all the aforementioned, the RBI and the Government appear to have informally agreed to raise the tolerable level of net capital inflows to $150 billion, up from the earlier figure of around $110 billion. 2. China's policy of keeping its currency pegged to a steadily declining dollar confers significant advantages on Chinese exporters. This has raised concerns among its trade competitors, especially those from other emerging economies. Atleast some of them have already started open-market operations to buy up dollars, and more look likely to follow. Recently, after many years, the Bank of Japan carried out foreign exchange market interventions to keep the yen from appreciating any further. The central banks of Brazil, Thailand and South Korea have also been active in the foreign exchange markets to limit the appreciation of their respective currencies. 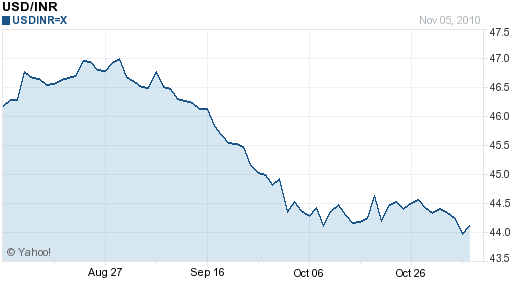 The Rupee has appreciated strongly against the dollar. Led by the export-dependent software industry, Indian exporters have been mounting pressure on the government to take action to stem the appreciation. However, the RBI has been remarkably reluctant to buy this line and has steadfastly refused to intervene. The exporters have been advised to become more competitive to respond to such market pressures, instead of relying on government crutches. In fact, the RBI appears to have taken a measured and long-term view of the rupee appreciation. In a recent speech, the RBI Governor even said that "currency interventions should be resorted to not as an instrument of trade policy but only to manage disruptions to macroeconomic stability" and cautioned about the costs of such interventions. 3. The recent second round of quantitative easing announced by the US Federal Reserve has been met with strong criticism across the world. The German finance minister denounced it as "undermining the credibility of US financial policy". Many emerging economies too have criticized the move, describing it as postponing structural adjustments in the US economy and exacerbating the global macroeconomic imbalances. India has been the only major economy to support US QE. It has acknowledged theimportance of monetary accommodation for economic recovery in the US and the importance of a healthy US economy to global economic prospects. 4. In a classic inversion of roles, India today appears on the free-market side of the globalization debate more than even many developed economies. Apart from certain controls on food-grain exports, it has been continuously liberalizing its economy, albeit at a slow pace. This trend has been in contrast to protectionist sentiment on the rise elsewhere, including the US. In response to the outsourcing bogey, the US has tinkered with various measures like limits on visas for IT personnel from abroad and restrictions on firms receiving stimulus assistance outsourcing work abroad (discriminatory tax treatment based on whether the firms create jobs at home or abroad). It recently imposed fee hikes of $2,000 or more on H1-B and L-1 visas for highly-skilled foreign workers at firms employing more than 50 workers, with half or more of their workers on H1-B visas. Realizing the benefits of an open economy and expanding international trade, India has been steadily opening up its economy. This stands in contrast to the continuing reluctance of the East Asian countries to open their economies to trade. India has gone far ahead of even OECD economies like South Korea in liberalizing both its real economy and financial markets to international competition. 5. The contrasting fortunes of the developed economies and India to the sub-prime mortgage crisis has drawn attention to the role of regulators on all sides. How did India and its financial institutions, despite its relatively open financial markets and conventional regulatory architecture, escape the fate of counterparts elsewhere? The RBI has used multiple instruments and a menu of options to manage the external sector and the monetary policy both before and in response to the sub-prime crisis. It has followed a carefully sequenced movement (which is also dependent on the developments in both the real economy and financial markets) towards capital account convertibility and controls on debt flows - both private and inflows into risk-free sovereign debt instruments to take advantage of interest differentials (carry trade). And all this has been backed up with strict enforcement of regulations. 6. India has contributed its fair share to addressing the global macroeconomic imbalances - skewed trade, savings, consumption, and investment preferences. In stark contrast to countries like China which implicitly suppresses local consumption, India has one of the largest shares of domestic consumption. Its domestic savings rate at around 35%, which while not adequate, has grown significantly over the past decade. At a time when the developed economies are attempting to export their way out of recession and emerging economies want to continue with their export-dependent growth model, India is one of the handful of major economies willing to provide aggregate demand. Unlike, the closed and export-oriented East Asian economies, India has steadily liberalized its economy and is an increasingly significant market for global exporters. "The biggest problem thrown up by capital flows is currency appreciation which erodes export competitiveness. Intervention in the forex market to prevent appreciation entails costs... If the resultant liquidity is left unsterilized, it fuels inflationary pressures. If resultant liquidity is sterilized, it puts upward pressure on interest rates which, apart from hurting competitiveness, also encourages further flows." "In as much as lumpy and volatile flows are a spillover from policy choices of advanced economies, the burden of adjustment has to be shared. It’s unrealistic to expect emerging market economies to carry the full burden of lifting global growth... Managing currency tension will need shared understanding on keeping exchange rates aligned to economic fundamentals and an agreement that currency interventions should be resorted to not as an instrument of trade policy but only to manage disruptions to macroeconomic stability." "The surplus economies will need to mirror these efforts — save less and spend more, and shift from external to domestic demand. They need to let their currencies appreciate." Are US, China, and Germany listening? Among the major economies, India has the lowest exports to imports ratio. As India's economic prospects improve, euphoric voices like this about the possibility of double-digit economic growth rates are bound to rise. But such speculation, anchored around the memories of China's spectacularly long period of double digit growth and our own brief interlude with similar growth last decade, overlook the presence of very strong headwinds. In this context, the work of economists like Dani Rodrik cautions against such hope and speculation. Three arguments are worth examining. 1. Apart from favorable domestic conditions, the long period of East Asian economic growth, whose salience is amplified manifold by China's rise, benefited from a happy confluence of benign external conditions. This period of unconditional convergence coincided with favorable geo-political dynamics (the US provided geo-political stability, which also relieved E Asian economies from spending on defense), high-noon of globalization facilitated by sharp fall in tariffs and un-bundling of global manufacturing supply chains, rapid emergence of trade facilitating technologies like containerization and ICT, a receptive consumer market in US and Europe, availability of abundant cheap domestic and global capital, and so on. These trends are either considerably attenuated or have run its course. But all narratives of India's high growth prospects are significantly predicated on the continuation of these conditions. Furthermore, there is the strong likelihood of technological disruption of the labor market due to increasing automation and resultant disemployment. While these forces are not likely to immediately bind in any significant manner in countries like India, their potential to disrupt global manufacturing and thereby global labor market, is considerable and deeply uncertain. These are first order headwinds that the Indian economy will have to surmount in its quest for growth comparable to what the East Asian economies sustained for long periods. 2. The second headwind comes from the changes taking place in manufacturing which raises questions about the traditional national economic development path. Manufacturing has traditionally provided the platform for rapid national economic development across history. Countries that have industrialized rapidly have done so by focusing on manufacturing and by moving up the manufacturing escalator - from less sophisticated to more technologically advanced products. 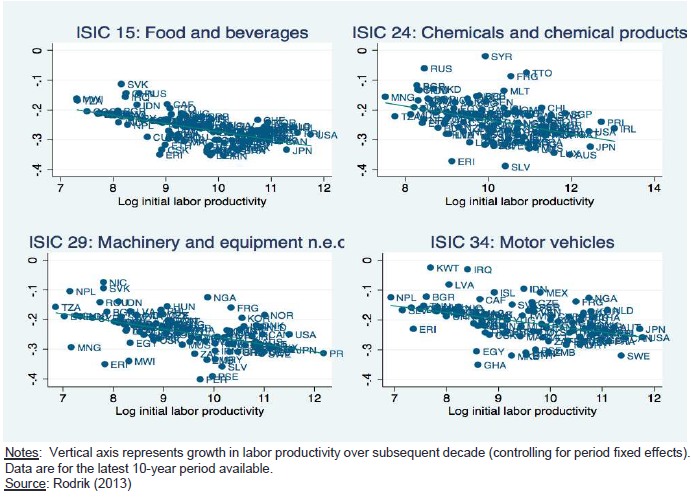 Labor productivity in manufacturing has tended to "converge to the frontier"- the smaller the initial incomes, higher the growth in labor productivity (and therefore incomes). This convergence is significant in formal manufacturing, though absent in informal manufacturing. This feature of manufacturing sector helps absorb large number of less skilled labor, with prospects of moving up the skill chain on the escalator of industries. But, as Prof Rodrik and others argue, such manufacturing sector growth may be constrained by the weakening of the aforementioned favorable forces. They characterize it as "premature de-industrialization". Such de-industrialization, observed in the development trajectories of all advanced countries, appears to be happening much earlier among the emerging economies. In India, manufacturing's share of output has been stagnant at about 14-16% of GDP for nearly four decades and its share of employment peaked at 13% of labor force in 2002 and has since been trending downwards. 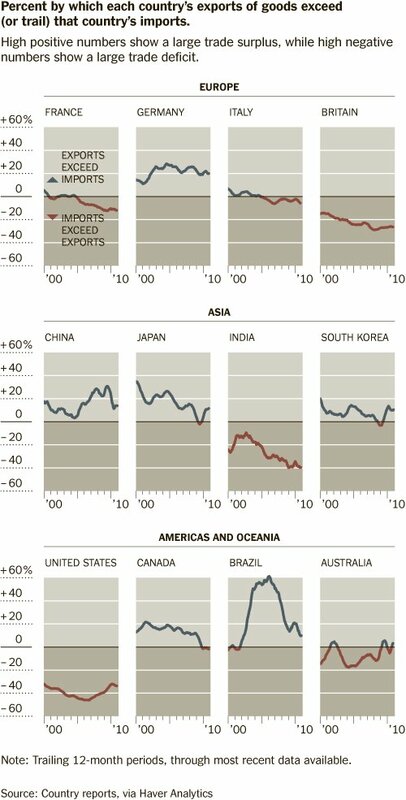 As the graphic below shows, this feature has been true of even many East Asian economies, including China, who have started de-industrializing earlier than their western counterparts. 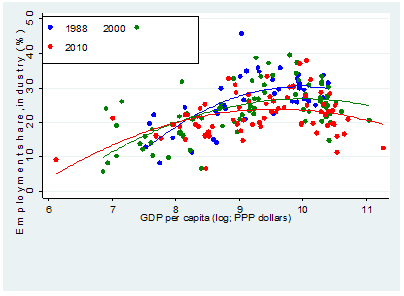 As can be seen, India started de-industrializing at a GDP per capita of $2000, in contrast to the $9000-11000 income levels at which manufacturing in western economies started decline. 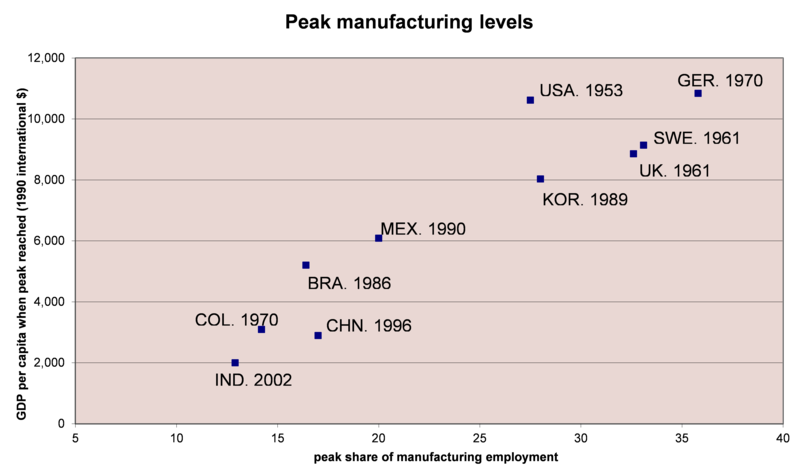 In fact, as the graphic from cross-national panel data below by Arvind Subramanian shows, at any stage in their development, not only are countries devoting less workforce to industries (the downward shift in the curves) but also the point of time at which industrial share of employment peaks is happening earlier (leftward shift in the curves). This potentially dampens the prospects for manufacturing led rapid growth for countries like India and Africa. 3. In all the East Asian economies, the de-industrialization has been accompanied by proportionate growth in the services sector, "making them service economies at substantially lower levels of income". This has led to some commentators pointing to the potential for a new era of services led economic growth. The example of India's successful IT sector has often been cited in support of this, though an a cursory empirical analysis would reveal this as misleading, given its small size and limited relevance to India's overall economic growth. Prof Rodrik's argument, brought out also in this article, is that the inherent dynamics of services sector militates against generating similar growth and job creation trends as with manufacturing. 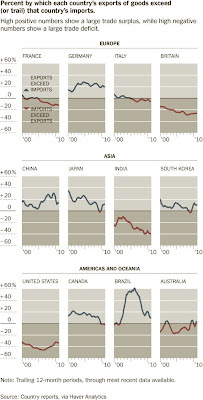 The graphic below shows that there are very few examples of simultaneous growth of both productivity and employment. The high-productivity sectors, which are typically tradeable, being skill-intensive, cannot absorb much of the not so skilled workers who dominate the 12 million or so people entering India's workforce every year. In fact, as the graphic below from Arvind Subramanian shows, the more productive and therefore rapidly expanding (and mostly tradeable) services are also highly skill-intensive, far more than manufacturing. 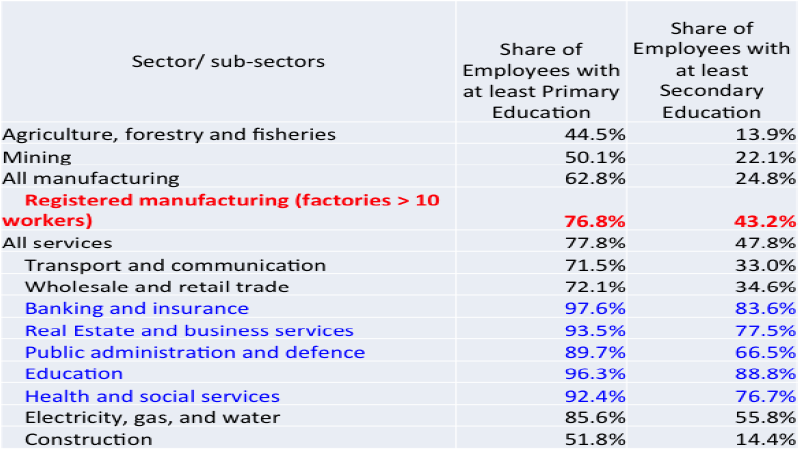 Further, unlike manufacturing, there is limited prospects for natural progression up the skill chain in services sector. While a textile or toy maker can with minimal training migrate into assembling electronic goods, the prospects of a barber or housekeeper moving into business services or banking, even at the lower end of that service, is remote or non-existent. India's woeful deficiencies in education and skill development would certainly come in the way of it being able to reap the benefits from tradeable services in any significant manner. It would require atleast more than a decade of intensive focus on education and skill development for the country to realize more substantial benefits from tradeable services. And even then, like with manufacturing, there are significant uncertainties over the possible disruption to parts of the services sector, especially at its labor-intensive lower end, from technological advances. The less productive non-tradeable services face self-limiting constraints - labor absorbing services are less productive and therefore slow growing, whereas the fast growing and more productive services experience higher relative wage growth with resultant limits on job creation. As Dani Rodrik writes, "services sectors that have the best productivity performance typically shed labor; labor absorbing sectors typically have worst productivity performance". It is therefore difficult to envision non-tradeable services as being the predominant channel for productive employment creation and rapid economic growth. To conclude, global political, economic, and technological environment is undergoing important shifts. The traditional get-rich-quick route of escalator industries looks increasingly out of bound. And the prospect of services becoming the new rapid growth sustaining platform does not appear promising. In the circumstances, India and others will have to navigate against the combination of all three headwinds in their quest to attain high economic growth rates. In case of India, its preparedness - poor quality of human resources and pervasive weakness in state capability - constrain the country's ability to overcome these headwinds. The shackles imposed by restrictive regulations exacerbate our weaknesses, further limiting the ability to achieve high growth rates and sustain it for prolonged periods. With business as usual, given its massive size, even with all these internal weaknesses and headwinds, the country may grow rapidly in short bursts (as happened for a few years in last decade) interspersed with longer moderate growth periods. Sustaining very high growth rates for long periods like East Asia would require large-scale and long-drawn reforms in numerous areas coupled with concerted efforts to improve human resource capacity and state capability. Even if the reforms are initiated with vigour, it is unlikely to result in any dramatic gains in the short or medium-term. This, rather than cognitive biases, should form the basis for any examination or speculation on the country's long-term growth prospects.